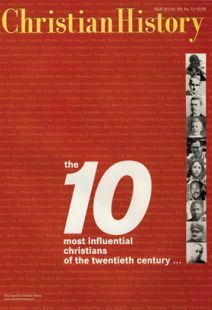 OF ALL the outstanding black American religious leaders in the twentieth century, one of the least recognized is William Seymour, the unsung pastor of the Azusa Street Mission in Los Angeles and catalyst of the worldwide Pentecostal movement. Only in the last few decades have scholars become aware of his importance, beginning perhaps with Yale University historian Sidney Ahlstrom, who said Seymour personified a black piety “which exerted its greatest direct influence on American religious history"—placing Seymour’s impact ahead of figures like W. E. B. Dubois and Martin Luther King, Jr.
William Joseph Seymour was born in Centerville, Louisiana, on May 2, 1870 to former slaves Simon and Phyllis Seymour. Raised as a Baptist, Seymour was given to dreams and visions as a youth. At age 25, he moved to Indianapolis, where he worked as a railroad porter and then waited on tables in a fashionable restaurant. Around this time, he contracted smallpox and went blind in his left eye. In 1900 he relocated to Cincinnati, where he joined the “reformation” Church of God (headquartered in Anderson, Indiana), also known as “the Evening Light Saints.” Here he became steeped in radical Holiness theology, which taught second blessing entire sanctification (i.e., sanctification is a post-conversion experience that results in complete holiness), divine healing, premillennialism, and the promise of a worldwide Holy Spirit revival before the rapture. In 1903 Seymour moved to Houston, Texas, in search of his family. There he joined a small Holiness church pastored by a black woman, Lucy Farrow, who soon put him touch with Charles Fox Parham. Parham was a Holiness teacher under whose ministry a student had spoken in tongues (glossolalia) two years earlier. For Parham, this was the “Bible evidence” of the baptism in the Holy Spirit. When he established a Bible school to train disciples in his “Apostolic Faith” in Houston, Farrow urged Seymour to attend. Since Texas law forbade blacks to sit in classrooms with whites, Parham encouraged Seymour to remain in a hallway and listen to his lectures through the doorway. Here Seymour accepted Parham’s premise of a “third blessing” baptism in the Holy Spirit evidenced by speaking in tongues. Though Seymour had not yet personally experienced tongues, he sometimes preached this message with Parham in Houston churches. In early 1906, Seymour was invited to help Julia Hutchins pastor a Holiness church in Los Angeles. With Parham’s support, Seymour journeyed to California, where he preached the new Pentecostal doctrine using Acts 2:4 as his text. Hutchins, however, rejected Seymour’s teaching on tongues and padlocked the door to him and his message. What happened at Azusa Street during the next three years was to change the course of church history. Although the little frame building measured only 40 by 60 feet, as many as 600 persons jammed inside while hundreds more looked in through the windows. The central attraction was tongues, with the addition of traditional black worship styles that included shouting, trances, and the holy dance. There was no order of service, since “the Holy Ghost was in control.” No offerings were taken, although a box hung on the wall proclaimed, “Settle with the Lord.” Altar workers enthusiastically prayed seekers through to the coveted tongues experience. It was a noisy place, and services lasted into the night. Though local newspaper coverage spoke cynically about the “weird babble of tongues” of “colored mammys,” on street corners and trolley cars, the news intrigued the city. Whole congregations came en masse to Azusa Street and stayed while their former churches disappeared. Other Pentecostal centers soon sprang up around town. Reporting on all this was Frank Bartleman, an itinerant Holiness preacher and rescue mission worker, who wrote to the Way of Faith in South Carolina that “Pentecost has come to Los Angeles, the American Jerusalem.” His reports, which were printed and reprinted in the Holiness press, spread a contagious fever of curiosity about the Azusa Street meetings all across the country. In September, Seymour began publishing his own paper titled The Apostolic Faith. At its height, it went free to some 50,000 subscribers around the world. Though many came to mock and scorn, many others heard messages in known earthly languages uttered by uneducated blacks and whites that convinced them of the reality of the revival. Soon whites made up the majority of members and visitors, and black hands were laid on white heads to receive the new tongues experience. Soon an avalanche of “Azusa Pilgrims” descended on the mission to receive what were thought to be “missionary tongues,” which would enable preachers to go to the far corners of the world proclaiming the gospel in languages they had never learned. A list of Azusa pilgrims reads like a hall of fame for the new order of Pentecostal priests. From North Carolina came Gaston B. Cashwell, who later spread the Pentecostal message to the southern Holiness churches. From Memphis came Charles Mason who returned to lead the Church of God in Christ into the Pentecostal fold (now the largest black Pentecostal denomination in America). From Chicago came William Durham, who later formulated the “Finished Work” theology that gave birth to the Assemblies of God in 1914. To Seymour, tongues was not the only message of Azusa Street: “Don’t go out of here talking about tongues: talk about Jesus,” he admonished. Another message was that of racial reconciliation. Blacks and whites worked together in apparent harmony under the direction of a black pastor, a marvel in the days of Jim Crow segregation. This led Bartleman to exult, “At Azusa Street, the color line was washed away in the Blood.” Seymour dreamed that Azusa Street was creating a new kind of church, one where a common experience in the Holy Spirit tore down old walls of racial, ethnic, and denominational differences. Perhaps the most damaging challenge to Seymour came in 1909 when white female co-workers Florence Crawford and Clara Lum moved to Portland, Oregon, carrying with them the mailing list for The Apostolic Faith magazine. This cut off Seymour from his followers and effectively ended his leadership of the emerging movement. After the “glory years” of 1906 to 1909, the Azusa Street mission became a small black church pastored by Seymour until his death on September 28, 1922, and then by his wife, Jennie, until her death in 1936. It was later sold for unpaid taxes and demolished. Today, a Japanese Cultural Center occupies the ground. By the year 2000, the spiritual heirs of Seymour, the Pentecostals and charismatics, numbered over 500 million adherents, making it the second largest family of Christians in the world. Today, practically all Pentecostal and charismatic movements can trace their roots directly or indirectly to the humble mission on Azusa Street and its pastor. An old colored exhorter [Seymour], blind in one eye, is the major-domo of the company. With his stony optic fixed on some luckless unbeliever, yells his defiance and challenges an answer. Anathemas are heaped upon him who shall dare to gainsay the utterances of the preacher. Clasped in his big fist, the colored brother holds a miniature Bible from which he reads at intervals one or two words—never more. After an hour spent in exhortation, the brethren present are invited to join in a “meeting of prayer and testimony.” Then it is that pandemonium breaks loose, and the bounds of reason are passed by those who are “filled with the Spirit,” whatever that may be. “You-oo-po goo-ioo-ioo come under the bloo-oo-oo-boo-ido,” shouts an old colored “mammy” in a frenzy of religious zeal. Swinging her arms wildly about her she continues with the strangest harangue ever uttered. Few of her words are intelligible, and for the most part, her testimony contains the most outrageous jumble of syllables, which are listened to with awe by the company. Vinson Synan, dean of the School of Divinity at Regent University, is author of The Holiness-Pentecostal Tradition (Eerdmans, 1997). No misdeed went unpunished in Calvin’s Geneva.